The target audience for this page is the inter-agency team evaluating the CERP Aquifer Storage and Recovery (ASR) Project. In support of this project, we developed a new ELM (v2.8.6) module to simulate sulfate fate and transport within the greater Everglades region. Given the application objectives, the new sulfate module simply employs a "first-order" settling rate approach to aggregate the multiple ecological processes involved with in-marsh sulfate losses from the surface water column. The U.S. Army Corps of Engineers is funding this ELM development and application project. This page provides the ASR Project team with results of their requests to provide ELM simulation results under the different Baseline and Alternative planning scenarios. The Model Documentation report on the ELM v2.8.6 historical hindcasting (calibration) performance assessment for the new sulfate module (including data, code, and model performance assessment) is found in the Publications link. Note: That Model Documentation Report is separate from the documentation of the ELM applications that supported analysis of ASR alternatives, which is the topic of this web page. 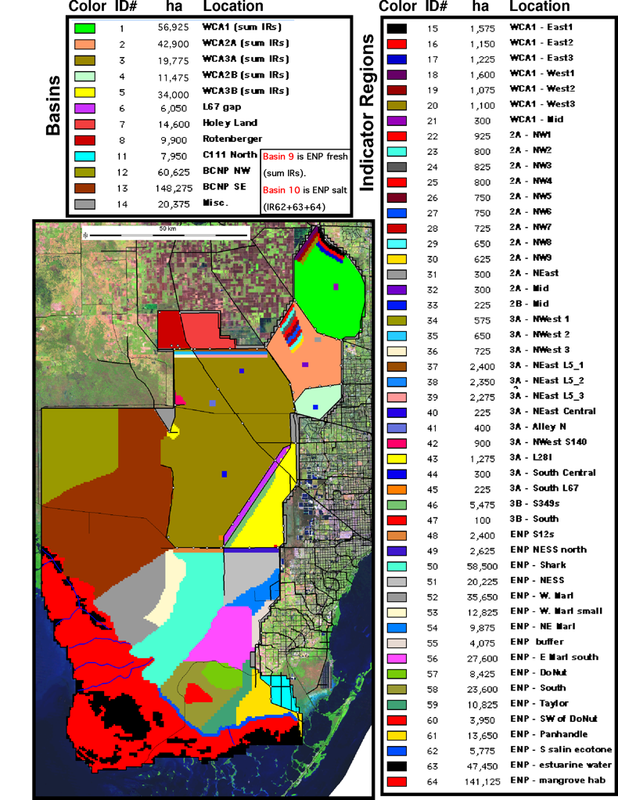 After acceptable calibration/validation model performance assessments, the regional 500 m grid resolution ELM application was used to evaluate a suite of future scenarios of sulfate loading into the Everglades. As described below, different ASR scenarios route ASR-derived sulfate through Lake Okeechobee, then into the Everglades Stormwater Treatment Areas (STAs) and the greater Everglades (domain of ELM). The Lake Okeechobee Environment Model, a new Simple Model of STAs (SMSTA), and other quantitative tools (see below) were used to establish boundary-condition sulfate loads to the Everglades, with the ELM simulating the downstream landscape patterns of sulfate availability over decadal time scales in the greater Everglades. The results of this Everglades sulfate modeling effort will be utilized by U.S. Geological Survey mercury methylation experts (Drs. William Orem and David Krabbenhoft) to quantify potential (sulfate-influenced) mercury methylation patterns in the Everglades under the ASR future scenarios - for use in CERP team evaluation of this aspect of the ASR project. This section links to documentation of model assumptions, inputs, and outputs for the 2050B2 and CERP0 ELM simulation runs for the ASR Project. Timeline of updates to this page. May 30 2013 -- Posted (above) summary report of the evaluations of ASR project Alternatives. May 6 2013 -- Posted daily time series of sulfate concentrations within all Basins/Indicator-Regions. May 05 2013 -- Posted new simulations of all Project Bases and Alternatives (2050B2, ASR_BASE, ASR_ALT2C, ASR_ALT2V, ASR_ALT4V), which a) correct tidal (Gulf and Bay) boundary condition sulfate concentrations, and b) incorporate the new Basin/Indicator Region (BIR) input map used for postprocessing. (These changes had no effect on model results within domain of interest to ASR Project). However, the new runs were post-processed with sulfate snapshot Performance Indicators using the new"ASR stress periods" instead of the standard wet&dry season snapshots for wet/avg/dry years. See a) new Perfomance Measure Descriptions, b) the addition of the document defining "ASR stress periods", and of course, c) the updated Performance Measure/Indicator output summaries. Mar 29 2013 -- Posted (March 20 output version) raw model sulfate outputs in NetCDF format; (reminder to ASR team - pending - we will re-run all sims after we get consensus on our final pre-processing & post-processing configurations & data, and will thus replace all post-processed and raw model outputs from March 20; little/no effect on sulfate results specific to ASR Project). Mar 21 & 26 2013 -- Posted additional documentation. Mar 20, 2013 -- Posted results for simulation of the 2050B2, the CERP0 ASR_BASE, and three CERP0 ASR scenarios (Performance Measures may be modified in near future). 37 Kb - Summary table of input data for simulations. 1.4 Mb - Input map data that are common to all ASR project simulations. Purpose: A simple method to mix daily inflows of water volumes and sulfate masses from all source waters flowing into an STA, and estimate the subsequent daily outflow sulfate concentrations. Developed specifically in support of the CERP ASR project, to evaluate among-Alternative, relative differences in downstream Everglades sulfate fate and transport. 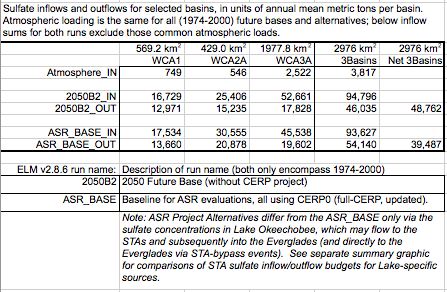 In this ASR project, the only relevant difference among Project Alternatives are Lake O sulfate concentrations, which may be propagated downstream to STAs and the Everglades. 41 Kb, March 21, 2013 Brief documentation of SMSTA methods and assumptions. Excel file, 15 Mb, March 21, 2013 Zip-compressed Excel file containing input and output data of SMSTA; see below SMSTA summary tables graphic. Note: For detailed hydrologic assumptions used by the SFWMM (whose managed water control structure flows drive these ELM simulations), please see the relevant documentation for the application of the SFWMM. 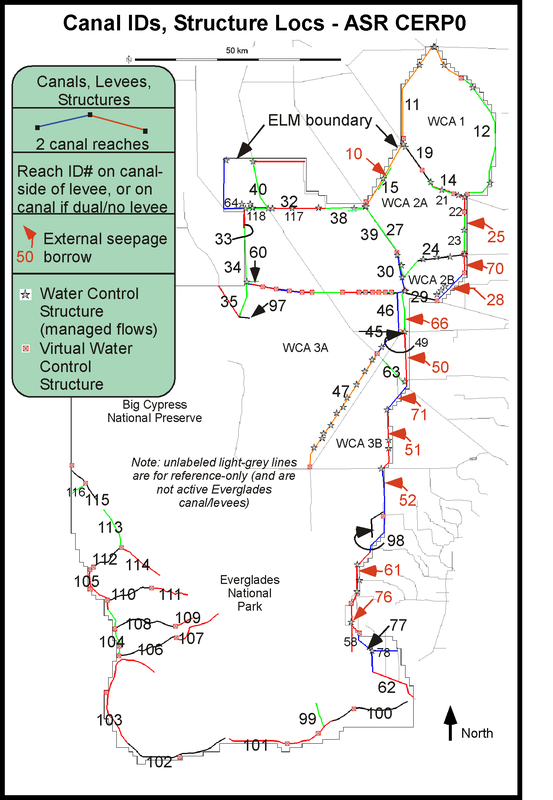 ELM canal/levee and water control structure maps, 2050B2 and CERP0. 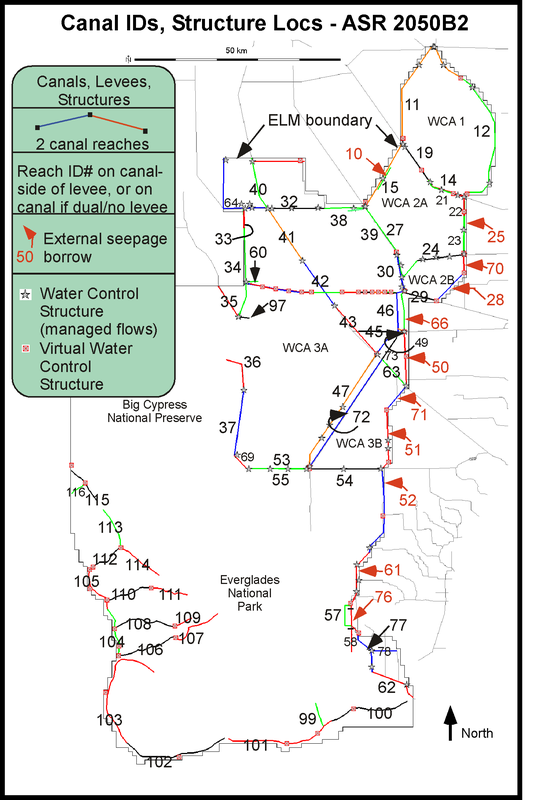 ELM water control structures: database export graphics, 2050B2 and CERP0. 8.4 Mb, March 21, 2013 - 2050B2: Water control structure attributes, including into-domain constituent (P, SO4, Cl) inflow concentrations. 8 Mb, March 21, 2013 - CERP0: Water control structure attributes, including into-domain constituent (P, SO4, Cl) inflow concentrations. 0.1 Mb, May 5, 2013 - Summary table of the Performance Measures/Indicators that are used to make relative comparisons among ELM-simulated baselines and alternatives. Includes brief description of the Performance Measure or Indicator, and guidance on their use and interpretation. 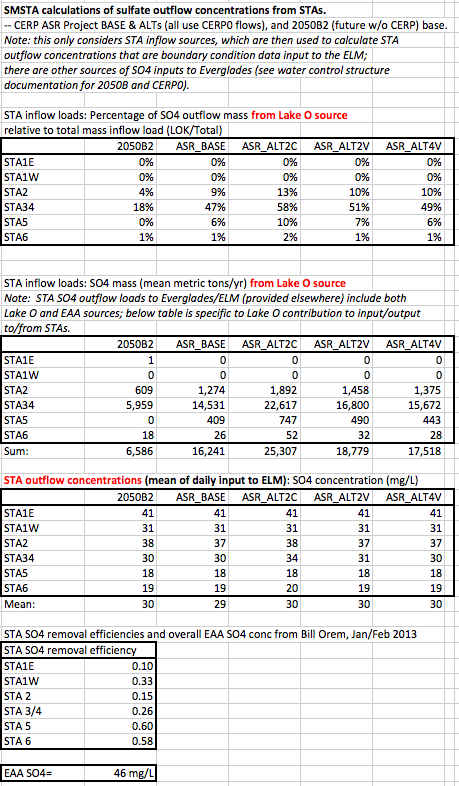 Summary of Sulfate Performance Measure/Indicator Results (all Bases and Alts). 1.6 Mb, May 5, 2013 - 2050B2, ASR_BASE, ASR_ALT2C, ASR_ALT2V, ASR_ALT4V: Summary graphic (area of marsh within the model-domain) of the sulfate Performance Measure/Indicator differences between 2050B2 and ASR_BASE, and between each ALT simulation relative to the ASR_BASE base. 0.1 Mb xls file, May 5, 2013 - Excel (.xlsx) file containing the data table and graphics that generated the above pdf graphic. Time Series of Sulfate Concentrations within Basin/Indicator-Regions (all Bases and Alts). 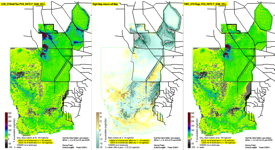 98.1 Mb, May 5, 2013 - Excel (.xlsx) file containing raw output data for 2050B2, ASR_BASE, ASR_ALT2C, ASR_ALT2V, ASR_ALT4V: Daily time series of sulfate concentrations (and several other metrics) within each Basin/Indicator-Region. As indicated above in the SFWMM and ELM simulation run descriptions, we considered two future-baseline runs: a) the 2050 future without CERP is the 2050B2 baseline, and b) the ASR_BASE is the formal baseline for evaluating ASR Project Alternatives - the ASR_BASE is the future with CERP (updated to CERP0), but without the additional ASR Alternatives that are being evaluated for this ASR Project. NOTE: thus, the (CERP0) ASR_BASE and all ASR_ALTs use the same CERP0 managed hydrology; in this Project, the only hydrologic differences are between the 2050B2 and the CERP0 (ASR_BASE) runs. In addition to the formal sulfate Performance Measures (comparing each ASR_ALT to the ASR_BASE) to be used in ASR Project evaluations, below we provide supplementary hydro-ecological Performance Indicators to compare the without-CERP (2050B) and with-CERP (ASR_BASE) baseline simulations, so that the team can best understand the hydro-ecological flows/dynamics associated with future CERP relative to future-without-CERP. surface water depth (POS mean, and seasonal snapshots, model variable name is "SfWat"). 40 Mb, May 5, 2013 - ASR_BASE vs 2050B2: Maps of the SO4 and other hydro-ecological Performance Measure/Indicator differences between the two simulations. The comparison of these two baseline runs is not part of the evaluation of the ASR Alternatives relative to the ASR_BASE (see below). 9 Mb, May 5, 2013 - ASR_ALT2C vs ASR_BASE: Maps of the SO4 Performance Measure/Indicator differences between the two simulations. 9 Mb, May 5, 2013 - ASR_ALT2V vs ASR_BASE: Maps of the SO4 Performance Measure/Indicator differences between the two simulations. 9 Mb, May 5, 2013 - ASR_ALT4V vs ASR_BASE: Maps of the SO4 Performance Measure/Indicator differences between the two simulations.